Bomb the System is a drama film written and directed by Adam Bhala Lough, which was released to film festivals in 2002 (see 2002 in film) and American theaters in 2005. It revolves around a group of graffiti artists living in New York City who decide to make a mark on the city, and stars Mark Webber, Gano Grills, Jaclyn DeSantis, Jade Yorker, Bonz Malone, Kumar Pallana and Joey SEMZ. 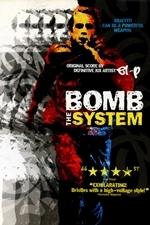 Bomb the System was the first major fictional feature film about the subculture of graffiti art since Wild Style was released 1982. Several well-known graffiti artists participated in the making of the film including Lee Quinones, Cope2 and Chino BYI. The film's score and soundtrack were composed by El-P. In January 2004 the film was nominated for an Independent Spirit Award for Best First Feature. Rolling Stone called the film a "next-gen update of 1982's Wild Style. With strong whiffs of Trainspotting and Kids" that "distinguishes itself with streaky, Krylon-bright editing and El-P's eerie soundtrack beats." Village Voice noted the movie was "birthed from a blunt-fueled blend of Aronofskian frenzy and nostalgia for the agreeable griminess of mid-'90s Wu-Tang Clan videos."